Kingston, Jamaica- Usain Bolt has warned American sprinter Justin Gatlin not to expect anything easy on his pending return to the track. Bolt, who dominated both sprints over the last two years, said Gatlin, who is serving a four-year doping ban, might just have something waiting for him on his return. Earlier this week, Gatlin, who is expected back on the track July 25, said he is targeting Bolt, Gay and Asafa Powell, the world’s three fastest men, by saying “Times don’t scare me”. “I think he will find it a little more difficult from the last time he was here, because I think the game has stepped up a lot,” warned Bolt. 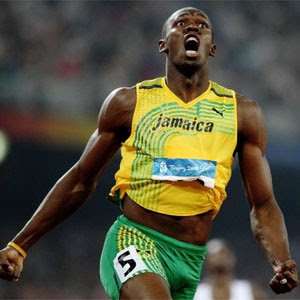 “I think he is going to have his hands full, not just by me and Asafa and Tyson, but a lot of other upcoming sprinters, but it should be good,” added Bolt, who said he welcomes Gatlin back when the time is right. “It’s more competition and better for the sports, so I am looking forward to it,” said Bolt, who said he would be ready to race Gatlin anywhere. Since Gatlin’s absence from the track, Bolt has dominated with electrifying runs, first at the Beijing Olympics with times of 9.69 and 19.30, but lowered those world record marks to 9.58 and 19.19 respectively at last summer’s World Championships in Berlin.